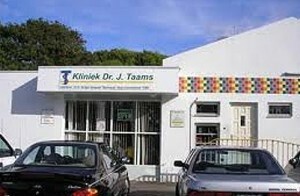 WILLEMSTAD – The embattled Taams clinic is now owned by the Antillean Adventist Hospital. The Advent was the only party which did a bid during the auction held by the Orco Bank, despite the great interest in the auction. The Advent was represented by its Director, Mrs. Cenaida Panneflek-Richards. The clinic was sold for 12.6 million guilders, which covers all the debts to the Orco Bank. This was stated by both the Director of the clinic, Dr. Earl Esseboom and the Director of the bank, Mr. Kenny Canword. That means that there will be an ‘Advent II’, whether or not they will retain the name Taams Clinic is not yet known. Advent has also received approval from the Minister of Public Health, Dr. Ben Whiteman and the Social Insurance Bank (SVB) to operate a hospital under the existing license at a second location.